The essence of Test Driven Development (TDD) can be summarized most succinctly as “red, green, refactor”. Following this practice will tend to make your code more reliable, cleaner, and better designed. It is no magic bullet, but you doing TDD is better at programming than you not doing it. However, a significant barrier to adoption of the practice is the (justifiable) perception that you will go slower when you start doing it. This is true in the same way that sloppy musicians get relatively proficient being sloppy, but if they really want to excel, they have to slow down, perfect their technique, and gradually speed things back up. 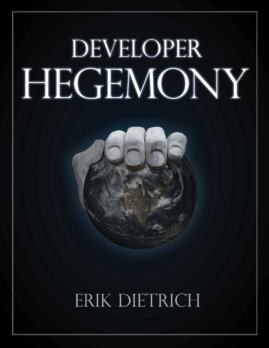 My point here is not to proselytize for TDD. I’m going to make the a priori assumption that testing is better than not testing and TDD is better than not TDD and leave it at that. My point here is that making TDD faster and easier would grease the skids for its broader adoption and continue practice. I’ve been unit testing for a long time, testing with TDD for a while, and also using CodeRush for a while. CodeRush automates all sorts of refactorings and generally makes development in Visual Studio quicker and more keyboard driven. As much as I love it and stump for it, though, I had never gotten around to using its test runner until recently. I saw the little test tube icons next to my tests and figured, “why bother with that when I can just hit Ctrl-R, T to execute my MS Test tests in scope?” But a couple of weeks ago, I tried it on a lark, and I decided to give it a fair shake. I’m very glad that I did. The differences are subtle, but powerful, and I find myself a more efficient TDD practitioner for it. I would write a unit test, and hit Ctrl-R, T, and the Visual Studio test results window would pop up at the bottom of my screen (I auto-hide almost everything because I like a lot of real estate for looking at code). For the first run, the screenshot there would be replaced with a single failing test. 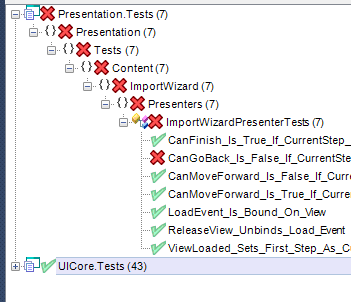 Then, I would note the failure, open the class and make changes, switch back to the unit test file, and run all of the tests in the class, producing the screenshot above. When I saw that this had worked, I would go back to the class and look either to refactor or for another failing test to add for fleshing out my class further. So, to recap, write a test, Ctrl-R, T, pop-up window, dismiss window, switch to another file, make changes, switch back, Ctrl-R, T, pop-up window, dismiss pop-up window. I’m very good at this in a way that one tends to be good at things through large amounts of practice, so it didn’t seem inefficient. If you look at the test results window too, it’s often awkward to find your tests if you run more than just a few. They appear in no particular order, so seeing particular ones involves sorting by one of the columns in the class. There tends to be a lot of noise this way. Notice the little green checks on the left. In my new process, I write a test, hit Ctrl-T, R, and note the failure. I then switch to the other class and make it pass, at which time, I hit Ctrl-T, L (which I have bound to “repeat last test run”) before going back to the test class. As that runs, I switch to the test class and see that my test now passed (I can also easily run all tests in the file if I choose). Now, it’s time to write my next test. So, to recap here, it’s write a test, Ctrl-T, R, switch to another file, make changes, Ctrl-T, L, switch back. I’ve completely eliminated dealing with a pop-up window and created a situation where my tests are running as I’m switching between windows (multi-tasking at its finest). In terms of observing results, this has a distinct advantage as well. Instead of the results viewer, I can see green next to the actual code. That’s pretty powerful because it says “this code is good” rather than “this entry is good, and if you double click it, you can see which code is good”. 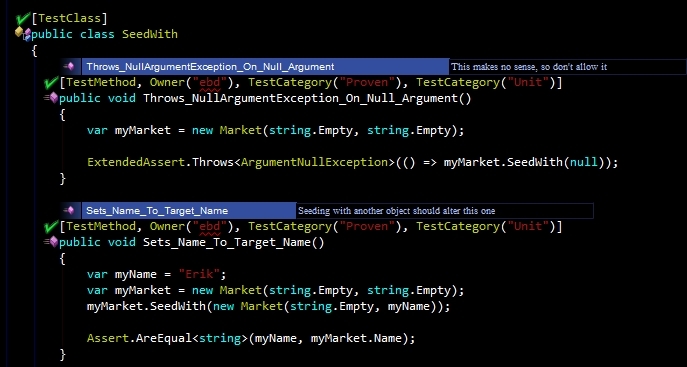 And, if you want to see a broader view than the tests, you can see green next to the class and the namespace. Or, you can launch the CodeRush test runner and see a hierarchical view that you can drill into, rather than a list that you can awkwardly sort or filter. Is shaving off a this small an amount of time worth it? I think so. I run tests dozens, if not hundreds of times per day. And, as any good programmer knows, shaving time off of your most commonly executed tasks is at the heart of optimizing a process. And, if we can shave time off of a process that people, for some reason, view as a luxury rather than a mandate, perhaps we can remove a barrier to adopting what should be considered a best practice — heck, a prerequisite for being considered a professional, as Uncle Bob would tell you. Depending on the size of the project, you might want to check out NCrunch if you haven’t already. It integrates with visual studio and runs the tests automatically behind the scenes. Then updates the little icons in the left margin to show you what is passing/failing and which code has tests covering it or not. I’ve been playing with it the past couple of months and like it so far. Although I haven’t used it in any huge projects yet, so not sure if performance will become an issue. Ooops. Not very good at the html when tired, apparently. It was supposed to say check out NCrunch with a link to the site. I have not seen NCrunch, but I did read in one of my grad school classes about a utility that would continuously run your tests during idle cycles during developments. I looked at the web page briefly and this does indeed look pretty cool. I think I’ll download it tomorrow and try it out. Thanks for the recommendation! As an update, I’ve now got NCrunch installed and running, and I like it. I’m also going to be trying it on a large project fairly soon, since I’m currently working on a large project. I may make a post with my findings and impressions.